Published on October 18, 2018 in Daily Dirt and Equipment & Products. Closed Tags: Argo XTV, Bad Boy, construction, construction industry, contractors, eXmark, Ferris, Grasshopper, Gravely, infrastructure, John Deere Gator UTV, Kubota, MICHELIN, Michelin TWEEl, Michelin Tweel Technologies, safety, TURF, TURF Products, UTV, UTV Products, Yamaha, ZTR. Michelin North America, Inc., is pumping up its Tweel airless radial line. 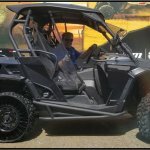 At the Green Industry Expo this week in Louisville, Ky., Michelin will introduce new products to its TURF and UTV lines. Three of these additions will feature 5-4.5 inch bolt-pattern configurations. “Michelin is listening and responding to customer requests. With the 5-4.5 inch bolt-pattern hub configuration comprising over half of the total commercial ZTR market, Michelin responded with these new offers in our award-winning airless tire product line,” said Olivier Brauen, vice president of Michelin Tweel Technologies. 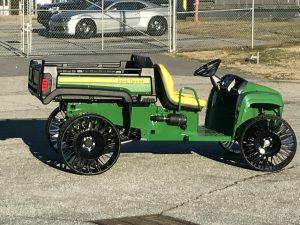 The redesigned MICHELIN® X® TWEEL® TURF Caster makes its debut after numerous customer requests. 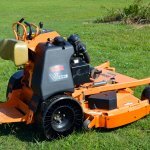 Available immediately in the 13×6.5N6 size, the new configuration is designed to provide enhanced performance and more stability with its flat, smooth design, fitting a larger range of mowers than the current ribbed version. New 26-inch UTV 4-110 mm bolt-pattern for several Honda, Kubota, Yamaha, and Argo ATVs and UTVs. 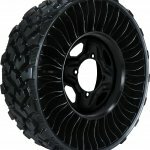 For more information on MICHELIN X TWEEL, visit www.michelintweel.com. Published on May 15, 2018 in Daily Dirt and Equipment & Products. Closed Tags: beach patrol, camping, construction, construction industry, contractors, emergency service response, farm, hunting, hurricane/tornado, landscape, logging, MICHELIN, Michelin TWEEl, Michelin Tweel Technologies, MICHELIN X TWEEL UTV, military operations, mine, parks, quarry, recreation, safety, tires, universities, UTV. 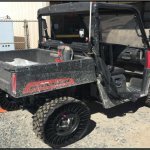 Michelin Tweel Technologies, a division of Michelin North America, Inc., is introducing a new 26-inch airless radial tire with a four-bolt wheel-pattern hub designed for use on UTV’s that will initially be sold as a fitment for the replacement market. Originally designed for military special operations use on light-tactical vehicles, the MICHELIN® X TWEEL® UTV 26x9N14 airless radial tire is a single unit that replaces the current pneumatic tire/wheel/valve assembly. Once bolted on, there is no air pressure to maintain, thus eliminating the need to carry spare tires, tools or repair kits. In the face of obstacles, the MICHELIN X TWEEL UTV product is designed to perform like a pneumatic radial tire, but with the durability and high damage resistance of an airless tire. The advanced spoke technology helps dampen the ride for enhanced operator comfort while providing outstanding lateral stiffness for excellent cornering and side-hill stability. In addition, the low-pressure contact helps provides outstanding off-road traction performance. The X TWEEL UTV offers quiet performance, energy-efficiency over tracks and robust design to eliminate downtime. 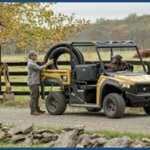 Additional hub configurations for John Deere, Honda, Kubota, and Argo will be available later in 2018 and 2019. New distribution outlets specifically for this product are currently being explored. 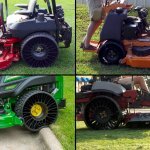 Commercially launched in 2012 with the MICHELIN X TWEEL SSL, the expanding MICHELIN X TWEEL product line includes airless-radial tires for skid steers, zero-turn mowers, stand-on mowers and golf carts. 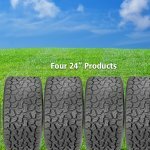 Michelin is the only manufacturer of airless radial tires and has been the recipient of multiple recognitions for the X TWEEL products in recent years. Dedicated to the improvement of sustainable mobility, Michelin designs manufactures and sells tires for every type of vehicle, including airplanes, automobiles, bicycles, earthmovers, farm equipment, heavy-duty trucks, and motorcycles. Michelin also offers a full range of innovative services and solutions that help make mobility safer, more efficient and more environmentally friendly. To create unique mobility experiences, Michelin publishes travel guides, hotel and restaurant guides, maps and road atlases. Headquartered in Greenville, S.C., Michelin North America, Inc. employs more than 20,000 people and operates 19 major manufacturing plants in the U.S. and Canada. 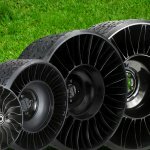 To learn more about Michelin Tweel Technologies visit www.michelintweel.com. Published on February 14, 2018 in Equipment & Products and National. 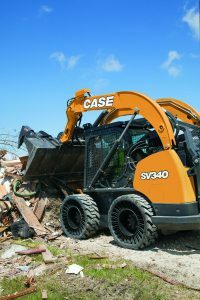 Closed Tags: Case, CASE Skid Steer loaders, construction, construction industry, contractors, equipment, heavy equipment, infrastructure, MICHELIN, Michelin TWEEl, Skid Steer Loaders, tires, Tweel. Published on January 7, 2018 in Daily Dirt, Equipment & Products and National. Closed Tags: Case, Case Construction Equipment, construction, construction industry, contractors, equipment, heavy equipment, MICHELIN, Michelin TWEEl, Michelin X Tweel SSL, safety, Skid Steer Loaders, X TWEEL SSL. Michelin North America, Inc., is partnering with CASE Construction Equipment to add the MICHELIN® 10N16.5 and 12N16.5 X® TWEEL® SSL as factory-approved/supplied option for skid steers loaders. 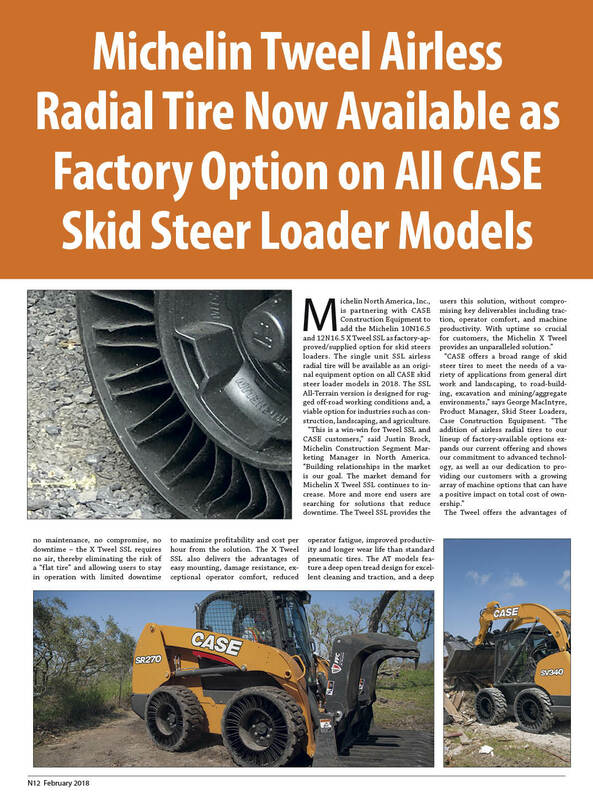 The single unit SSL airless radial tire will be available as an original equipment (OE) option on all CASE skid steer loader models in 2018. The SSL All-Terrain version is designed for rugged off-road working conditions and, a viable option for industries such as construction, landscaping, and agriculture. The TWEEL offers the advantages of no maintenance, no compromise, no downtime — the X TWEEL SSL requires no air, thereby eliminating the risk of a “flat tire” and allowing users to stay in operation with limited downtime to maximize profitability and cost per hour from the solution. The X TWEEL SSL also delivers the advantages of easy mounting, damage resistance, exceptional operator comfort, reduced operator fatigue, improved productivity and longer wear life than standard pneumatic tires. The AT models feature a deep open tread design for excellent cleaning and traction, and a deep layer of undertread allows the core to be retreaded. For more information on the Michelin X Tweel SSL, visit MichelinTweel.com. 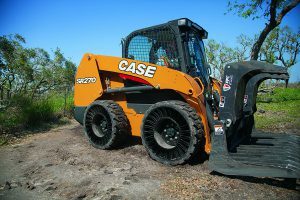 For more information on CASE skid steer loaders, visit CaseCE.com. The Michelin X Tweel SSL is one single unit, replacing traditional tire/wheel/valve assemblies. There is no need for complex wheel/tire mounting equipment. There is no air pressure to maintain once each tire is bolted on. The AT models feature a deep open tread design for excellent cleaning and traction, and a deep layer of undertread allows the core to be retreaded many times. The Michelin X Tweel SSL provides outstanding stability and enables a skid steer loader to work rapidly with more comfort for the operator, reducing driver fatigue while improving productivity. It delivers a consistent footprint with strong wear life that is two-to-three times that of a pneumatic tire at equal tread depth. The proprietary design provides great lateral stiffness while resisting damage and absorbing impacts. Additionally, the unique energy transfer within the high-strength poly-resin spokes reduces the “bounce” associated with pneumatic tires. Dedicated to the improvement of sustainable mobility, Michelin designs manufactures and sells tires for every type of vehicle, including airplanes, automobiles, bicycles, earthmovers, farm equipment, heavy-duty trucks, and motorcycles. The company also publishes travel guides, hotel and restaurant guides, maps and road atlases. Headquartered in Greenville, S.C., Michelin North America, Inc. (www.michelinman.com) employs more than 22,650 and operates 20 major manufacturing plants. To learn more about truck tires and services, visit www.michelintweel.com. Published on October 20, 2017 in Daily Dirt, Equipment & Products and National. 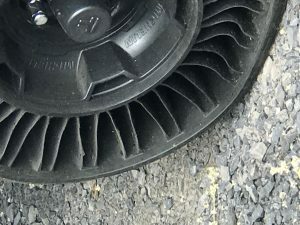 Closed Tags: airless tires, construction industry, contractors, equipment, infrastructure, landscaping, MICHELIN, Michelin Tweel Technologies, Michelin X TWEEL TURF, mowers, tires, Tweel. 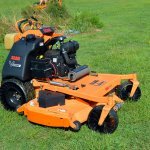 the addition of Ag-Pro as a distributor for X TWEEL TURF products. 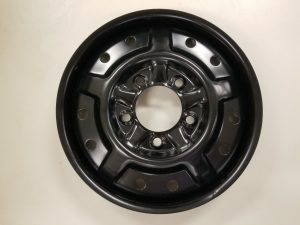 Scag and other operators of ZTR mowers utilizing a 26-inch, four-bolt pattern rear wheel will now be able to buy the no-compromise airless solution for their commercial mowers. Available through the TWEEL dealer network, the black hub version of the MICHELIN X TWEEL TURF is a single unit, replacing the current tire/wheel/valve assembly. It performs like a pneumatic tire, but without the risk and costly downtime associated with flat tires and unseated beads. Featured on the 2018 John Deere QuikTrak™ Stand-On commercial lawn mowers, the new 18-inch MICHELIN X TWEEL TURF will be available on this new equipment. The QuikTrak is John Deere’s top-rated stand-on machine for commercial mowers and landscapers. The four-bolt pattern yellow hub is also available on the 24-inch MICHELIN X TWEEL TURF, designed exclusively for the John Deere ZTrak™ 900 Series mowers with 54-, 60- and 72-inch deck sizes. In an exciting collaboration with Sunbelt Outdoor Products, the distributor will become a partner with Michelin to sell Michelin X TWEEL TURF mower and golf cart products. With seven distribution centers across the United States, Sunbelt Outdoor Products is a wholesale lawn and garden parts distributor, dedicated to servicing outdoor power equipment resellers. Retail customers will now be able to purchase Michelin X TWEEL TURF products through Ag-Pro Companies. Ag-Pro is one of the largest John Deere dealers in the United States. 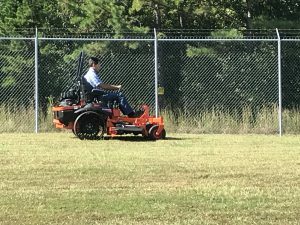 Headquartered in Boston, Ga., near Thomasville, Ag-Pro operates a total of 50 locations across Alabama, Georgia, Florida, South Carolina and Texas — offering sales, parts, and service — with 960 employees. Dedicated to the improvement of sustainable mobility, Michelin designs manufactures and sells tires for every type of vehicle, including airplanes, automobiles, bicycles, earthmovers, farm equipment, heavy-duty trucks, and motorcycles. The company also publishes travel guides, hotel and restaurant guides, maps and road atlases. Headquartered in Greenville, S.C., Michelin North America, Inc. (www.michelinman.com) employs more than 22,650 and operates 20 major manufacturing plants. To learn more about truck tires and services, visit www.michelintruck.com.